Click here to subscribe to our music video channel! Music in the classroom is crucial! This song was made for you to use to activate students for learning about interjections. 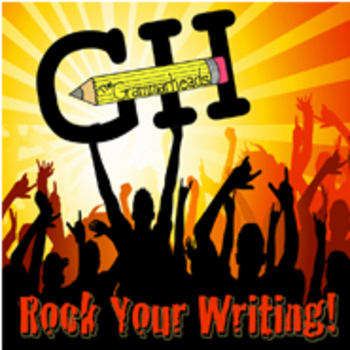 With this bundle, they will get a rockin' song with lots of examples of interjections and strong emotion. After watching and listening, you can give your students a quick 10-question quiz for an assessment. Use Grammarheads video bundles to give your students a new way to look at text! Grammarheads products are the perfect supplement to every day instruction. Use them as an activating strategy to get your kids pumped up about what you have to teach. Use them to fill gaps your general curriculum left open. You can even use them for karaoke in the classroom! Any way you cut it, they're a fantastic addition to your lesson plan. Your students get an original rock music video and text to work with, which encourages memorization skills, offers background knowledge, and builds reading fluency. Interjections are also part of our huge "Parts of Speech" Resource Bundle which includes 10 Worksheet Packets, 9 songs and 9 PowerPoints. The bundle covers all eight parts of speech - noun, pronoun, verb, adjective, adverb, preposition, conjunction, and interjection. It also includes subject, predicate and the four types of sentences. Now that's a rockin' value!